Equal parts soundbar, smart speaker and music center. 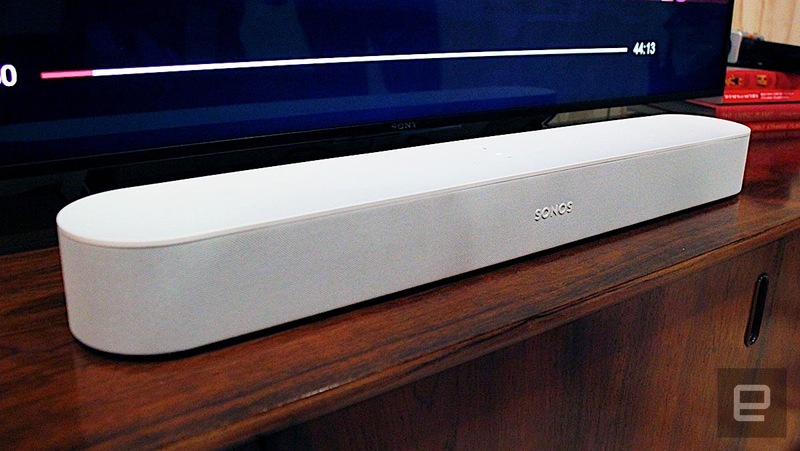 Sonos just announced the Beam, a smaller, smarter Playbar. It's all good and well to see it on stage, but what does it sound like? Luckily I just got to spend some time with it to find out -- and on first pass it feels like a winner. Not just for the rich, cinematic sound (which it appears to have) though. The Beam is also an all-around tantalizing prospect: a compact soundbar, Alexa replacement, that could also replace your regular music system. This all-in-one configuration won't be for everyone, but for those without a lot of living space that want to avoid the clutter of multiple speakers, it's definitely appealing. When Sonos CEO, Patrick Spence, took to the stage this morning, he said the company wanted to "help people listen better." This might be grade-A marketing speak, but it does hint at a problem facing the modern living space: too many gadgets. With TVs, AV systems, smart speakers and more perched around our most-used room, it's easy to see that we're risking overload. A situation that only gets more complex as each of these devices slowly adopts Alexa or Google Assistant. The Beam aims to slice through some of that noise, while at the same time performing the whole other job of multi-room audio that Sonos is famous for. In my demo, the company set up a faux front room, with a couch, TV and Beam. The first task was simply to play some music, which was kicked off not by the app (which Sonos users have come to know and... tolerate), but by Alexa. This functionality isn't new for Sonos, but it shows that the company is making it a core feature of all its new hardware. The pop ditty we heard sounded great, just as you'd hope from a premium speaker with vocals pushing through the center. This isn't a given as soundbars (which the Beam is at its core) because they're often configured for wider, cinematic sound stages. 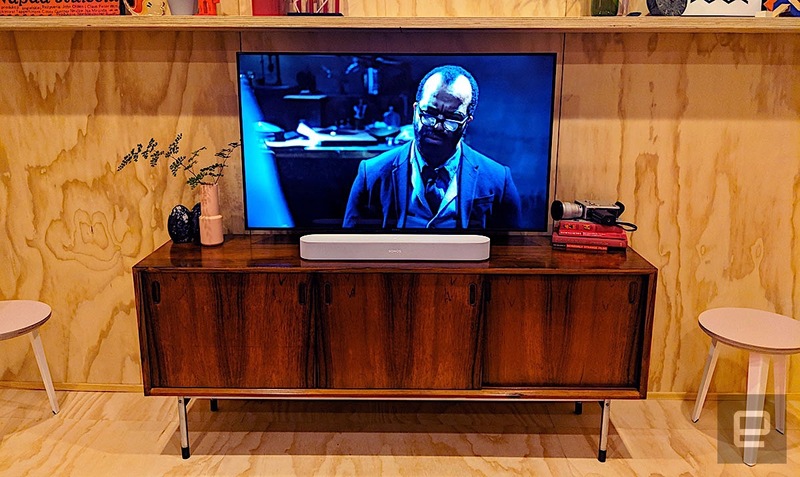 A representative explained that it was important that music sound just as good as movies, and it looks like they got that right, with more focus on the center speakers (of the four full-range woofers and one tweeter in Beam). We made a quick hop to a movie, again via Alexa (after a clearly pre-prepared skit where one of our hosts pretended to hunt for the remote) and the transition to a wider soundstage was seamless. A tense clip of Westworld and a moody scene from Arrival sounded just as wide and immersive as you'd hope. And, I will say, for a speaker this size (it's 60 percent smaller than the Playbar), surprisingly impactful. As if to drive the point home, a clip from Wall-E showed off the Beam's spatial abilities, as our robot friends zipped from left to right of the screen. With the Playbase ($699) and the Playbar (also $699) still in the Sonos lineup, you might be wondering where Beam ($399) fits. The answer is simple: in smaller rooms, for the most part. As the lower price might indicate, the Beam comes with fewer speakers (five, to the Playbase's 10), meaning there are some audio compromises here (no sub-woofer for one). That said, there's enough new stuff here -- Airplay 2, HDMI and Alexa support for starters) that for those looking to spruce up their front room, or even make that first step into the world of Sonos, this is a great way to do it.